What a Weekend!! 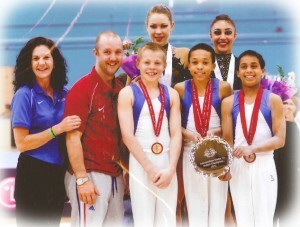 The first of a new format for British Gymnastics in staging a combined Mens Artistic (U.14 & Intermediates) and Rhythmic Junior and Senior British Championships 2012. Successfully organised at the Fenton Manor Sports Centre, Stoke-on-Trent on the weekend of 29th June – 1st July the event brought a bountiful medal haul for the City of Birmingham Gymnastics Club. Six British Champions; seven British title holders; eleven gold medals; three silver medals and two bronze medals between five Mens Artistic and two Rhythmic gymnasts made a total medal tally of sixteen! In the Rhythmic event: Francesca Jones not only became British Champion for the SIXTH time but also took four out of five individual apparatus gold medal titles, Hoop, Ball, Ribbon & Clubs, a noteworthy and unsurpassed achievement. In the same event fellow training partner and GB International, Mimi Cesar took the overall bronze medal title along with individual apparatus Gold for her Free routine; silver for Ribbon and Bronze for her Club and Ball routine. Well done to both girls. Also at the event City of Birmingham Rhythmic Coach, Lisa Higgins, was awarded with her Mastercoach Award, congratulations Lisa! In the U.14 Mens Championships Joe took the overall Championship title whilst also securing Gold on Pommel Horse and Parallel Bars and Silver on High Bar. In the Same event Hamish secured an Individual apparatus Gold on Floor and Josh and Individual apparatus silver medal on Parallel Bars; an excellent afternoon of competition for the boys. In the Mens Under 12 Championships category Jake took the Individual apparatus gold medal title on Parallel Bars and finished in 4th overall position. Congratulations on all of their successes and to all of the other City of Birmingham competitors that also competed.